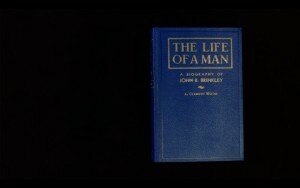 We have finally come full circle: the way that The Life of a Man functioned at this trial was a major source of inspiration for the entire structure of this film. We’ve represented the way the book worked in the trial pretty accurately in this scene, with Brown reading the more absurd portions out loud and forcing Brinkley to respond to them, Brinkley trying to say he doesn’t even know what’s in it, and eventually admitting he paid for it and published it himself as a sort of promotional item. "Defense attorneys led the doctor though a recital of his life and asked him at length about statements he had made in his advertisements and a biography" ("Brinkley Declares His Income Dropped After Publication," Corsicana Daily Sun, 23 Mar 1939, Thu, Page 3); "The Case of Brinkley v. Fishbein", Journal of the American Medical Association, May 13, 1939, Volume 112, No. 19, p. 1959; "The Case of Brinkley v. Fishbein", Journal of the American Medical Association, May 13, 1939, Volume 112, No. 19, pp. 1952-1969.